“A warm, late September day would be the perfect time for me to enjoy this Ciudad Condal to its fullest. The heavy crowds of noisy tourists have vanished, and I can have my Barcelona back. I would start the day with a cortado sweetened with honey, and a freshly baked croissant, or cruasán, as the Spanish call them. I like my breakfast extra-long, when I can sit in the rays of the sun, enjoying that morning energy you can almost touch. The fresh, vibrant air seems to animate everything around, from people to palm-trees, and the city’s green monk parakeets alike. Sipping on my coffee, I scribble down some ideas for articles, or just doodle in my diary, letting my rested mind crochet unwritten stories. I like to reserve my mornings for writing, my biggest passion, and my profession as well. After the cortado has kicked in, and my mind and senses are fully awakened, I’d stroll along the streets of the Gothic quarter, to feed my strange fascination for baroque and renaissance buildings, with their elaborate architecture. I enjoy losing myself on the narrowest alleys and discovering hidden medieval corners. 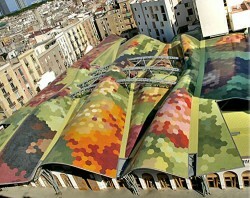 I’d surely stop in Plaça del Pi, to watch Barcelona’s local painters. It would have to be any Saturday, when they gather here, sunny or storm, to paint and display their wet frames, spreading around the pungent smell of chemical colors turned art. From here, I’d cross over to the Mercat de Santa Caterina, in Born, a fresh market where they also serve home-cooked meals and tapas. The mixed smells of the Mediterranean delicacies pull you closer to the cafeteria, where the Catalan waitress shouts out the orders to cover the rumble of the espresso machine. Belly-full and snoozed by the food, I catch the metro for a ride across town. Once in Plaça d’Espanya, I submerge – that’s the feeling I have going down the rolling staircase – towards the below-the-ground entrance of CaixaForum. I never get tired of going back to this free museum, for one because the exhibitions periodically change, but also for the building complex itself. An old, red-brick textile factory turned modern museum and cultural center, with interior courts and twisted passageways. And if you’ve never gone on its roof, do it next time you’re there! It’s all wavy and Gaudi-esque. Besides getting my art fix at CaixaForum, I slow down from the rhythm of the streets and cool off in the old stone rooms. 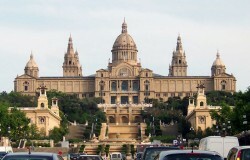 The museum lies at the feet of the Montjuïc hill, and if you climb this one up, all the way to the front stairs of MNAC, the National Museum of Catalonian Art, you get a spectacular view of the city. Probably my favorite place in Barna to take a break, while sipping a cup of absolute-must afternoon café con leche. After all this good food and lazing around soaked in culture, I need a boost of energy. My perfect ritual for that is a late afternoon rollerblading session. Going down to the sea, I start out around Marbella beach. Rolling my way on the Paseo Maritimo, feels more like a promenade than real exercise. Going past the string of beaches lined up, I stop at shore’s end, on the San Sebastià beach. I love to take a break here, sipping from a raspberry batido, and watching the city’s distant buzz from the curled up shoreline. Monica is a copywriter and content strategist specialising in the travel industry. Born and raised in Romania, she has lived for the past 10 years in Johnson City, Tennessee; Miami, Florida; Frankfurt, Germany and finally Barcelona, Spain for the last 4 years. Find out more about her work at www.changingtravels.com. OMG! I have been wanting to visit Barcelona. This article makes me want to stroll down the streets and visit the museum as well. You are such a great writer. I could see you basking in the morning sun, strolling through the museum and roller blading in the afternoon. So picturesque.